The Talwar vessel is a modified Krivak III-Class frigate. The Talwar-Class frigate is armed with an eight-cell 3S14E vertical missile launcher for 3M-54E Klub-N anti-ship missiles. The Talwar frigate supports naval forces during air, surface and sub-surface missions. The Talwar-Class guided missile frigate is a modified Krivak III-Class frigate in service with the Indian Navy. Built by Baltiysky Zavod, the frigate supports naval forces during air, surface and sub-surface missions. It is also used to detect and destroy enemy submarines and other surface ships. "In July 2006 the Indian Government signed a $1.6bn contract with Yantar shipyard for an additional three frigates." 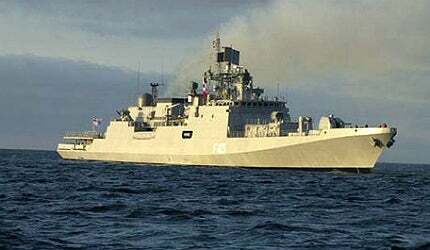 The first and second frigates in the class, the INS Talwar and INS Trishul, were commissioned in June 2003. The INS Tabar was commissioned in April 2004. In July 2006 the Indian Government signed a $1.6bn contract with Yantar shipyard for an additional three frigates. The first of three frigates, INS Teg (F45), was launched in November 2009 and delivered to the Indian Navy in April 2012. INS Tarkash (F46), the second, was floated out in June 2010 and delivered in November 2012. The last frigate, INS Trikand (F50), was launched in May 2011 and delivered in June 2013. The new frigates are armed with eight BrahMos supersonic cruise missiles instead of 3M-54E Klub-N anti-ship missiles. The Talwar was designed by the Severnoye Design Bureau. The topside and hull sections were redesigned to reduce radar cross-section, electromagnetic, acoustic and infrared signatures. The hull features an outward flare and the superstructure features a tumblehome angle. The design also incorporates stealth technologies. The Talwar is fitted with a Trebovaniye-M combat information and control system. The system integrates eight T-171 full-colour operator workstations and three central T-162 servers. It manages and controls all weapons on board, develops combat missions depending on the situation analysis and transfers the data to the weapon systems. The frigate is armed with an eight-cell 3S14E vertical missile launcher for 3M-54E Klub-N anti-ship missiles. The three-stage missile uses active radar guidance. The Klub-N reaches Mach 2.9 in the terminal stage and has a maximum range of 220km. The ship is also equipped with a Shtil-1 medium-range surface-to-air missile system. The system can launch SA-N-12 surface-to-air missiles through a 3S-90 missile launcher. A total of 24 missiles are accommodated in a magazine located below deck. The SA-N-12s have a range of 45km and use inertial guidance and semi-active radar homing. In the future, the frigate may be also fitted with Igla-1E portable air defence missiles. The vessel’s main gun is a forward-fitted AK-190. The 100mm gun incorporates stealth technology to reduce the radar signature of the ship. It has a firing rate of 60 rounds a minute and can engage targets within a range of 15.2km. The Talwar is also fitted with two Kashtan Air Defence close-in weapon systems. Each system includes two GSh-30k 30mm Gatling guns and two SA-N-11 surface-to-air missile clusters. The frigate is fitted with two twin 533mm DTA-53-11356 fixed torpedo tube launchers firing SET-65E / 53-65KE torpedoes. A 12 barrel RBU-6000 anti-submarine warfare rocket can fire 212mm 90R ASW rocket or RGB-60 depth charges. The ship’s countermeasures package includes a TK-25E-5 integrated electronic warfare suite. The system features an electronic support measures system, consisting of antenna arrays and a multimode jammer. The PK-10 ship-borne decoy dispensing system provides soft-kill defence capability. The system includes four KT-216 decoy launchers and remote control console. The Talwar has a helicopter deck and a hangar to allow the operations of a Ka-28 Helix-A ASW helicopter or a Ka-31 Helix-B airborne early warning helicopter. The helicopters are equipped with over-the-horizon radar systems to detect targets at long ranges. The helideck can also support the naval variant of the HAL Dhruv. "The Talwar is also fitted with two Kashtan Air Defence close-in weapon systems." The ship’s surface search radar is a 3Ts-25E Garpun-B radar operating at I-band frequency. It uses active and passive channels for long-range surface target designation. A MR-212 / 201-1 navigation radar and a Kelvin Hughes Nucleus-2 6000A radar are installed for short-range navigation and surface surveillance. The frigate is also equipped with a Ladoga-ME-11356 inertial navigation and stabilisation suite developed by Elektropribor. The Fregat M2EM 3D circular scan radar provides target indication to the Shtil-1 missile system. The Ratep JSC 5P-10E Puma fire control system integrates a phased array and target tracking radar. Talwar-Class frigates are equipped with combined gas turbine and gas turbine propulsion systems. The M7N.1E gas turbine plant includes two DS-71 cruise turbines and two DT-59 boost turbines. The turbines are connected to two shafts through two RO58 single-speed reduction gearboxes. Four Wartsila WCM-1000 generators and Kirloskar gen sets provide electricity for the vessel. Jamaran is the first indigenously built Mowj Class multi-purpose guided missile frigate of the Imperial Iranian Navy. Naresuan Class guided-missile frigates were built by the China State Shipbuilding Corporation, Shanghai, for the Royal Thai Navy.